As you can see, after some initial random movements of the design variables, the design variable gradually converges to x=-1 (the black curve) and the optimal value reaches 0. If you would like to call matlab functions in DotNet or com, and your function calls involve some functions which rely on lapack functions, and prior to Matlab 2010b, you may find that your program crashes. Tracing the problem, you will find this is due to a dll (mllapack.dll), and the problem is reported here, and here. 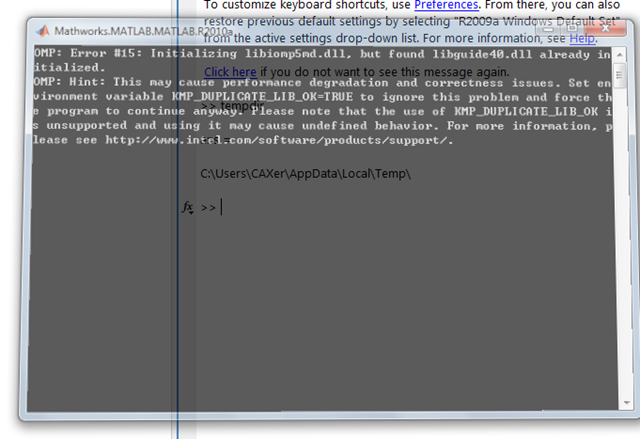 In Matlab 2010b, I have tested two functions which depend on the LAPACK, and it works now! Download demo VS2010 project here. Matlab ’s function is power, but not enough. Sometimes, you need some functionality from .net. One example is the Bezier curve class, which is absent in Matlab. In programming Matlab, suddenly it crashes. Face it. One of the occasion is when I call the norm function programmatically. In the interactive command window, there is no problem, but if you use it in script. Sorry, it just crashes, with a console window disappeared before you have time to read the details. After Google searching, here is the solution, and it worked for me at least: add a system variable “KMP_DUPLICATE_LIB_OK” with its value set to “TRUE”.